I love interviews! Said no one ever. Yikes, so much to think about and prepare for. I remember being so nervous about my interviews and I hated not knowing what questions were going to be asked. That’s why I know this episode is going to be so popular because our guest expert is going to break down exactly how to answer some of the top interview questions! So let’s dive in! Crystal Barrow is an attorney and career coach. Her goal is to empower and help go-getter women master the job hunt with the goal of building careers they love and deserve, on their own terms. 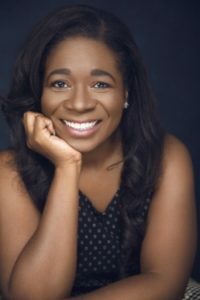 Having been employed in unique government positions and having served as an Assistant Dean of a law school career center, Crystal has navigated some pretty interesting career transitions and knows what it takes to get hired and level up your career so you can smile doing work you love. How does someone sell himself or herself during an interview? How to answer some of the common interview questions? What are some of the trickiest or more difficult interview questions people struggle with (i.e. Tell me about an adverse situation you had to deal with)? How do you recommend someone prepare for an interview? Does it matter if it’s a phone interview or an in-person interview? What type of questions should I ask the potential employer? Is follow-up after an interview required?